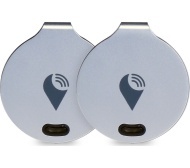 alaTest has collected and analyzed 11 reviews of TRACKR Bravo - Silver, Pack of 2. The average rating for this product is 1.6/5, compared to an average rating of 4.0/5 for other Camcorders for all reviews. People really like the battery and portability, but some have doubts about the price and usability. We analyzed user and expert ratings, product age and more factors. Compared to other Camcorders the TRACKR Bravo - Silver, Pack of 2 is awarded an overall alaScore™ of 76/100 = Good quality. The volume on the Trackr is so low that you can't hear it unless you are standing next to the item it is attached to and it's not adjustable. The range is very limited as it's bluetooth. Sorry but it's a waste of money. Good small size, really easy to set up. The range is rubbish, can't pick up signal for something that's not in the same room, absolutely useless on trying to track a missing dog etc. It will find your phone if in same room !! It area it covers was minimal, as the price they are I would like a bigger aI wanted it for my car but it didn't pick it up outside FRONT DOOR !!!! It doesn't work unless your very near, which is a bit pointless. Emailed maker on multiple occasions about my concerns and have not had one reply. Finds you keys when you're close. Your led to believe this is a GPS tracking device! It's not, it works on blue tooth! Badly! Would not recommend this product!